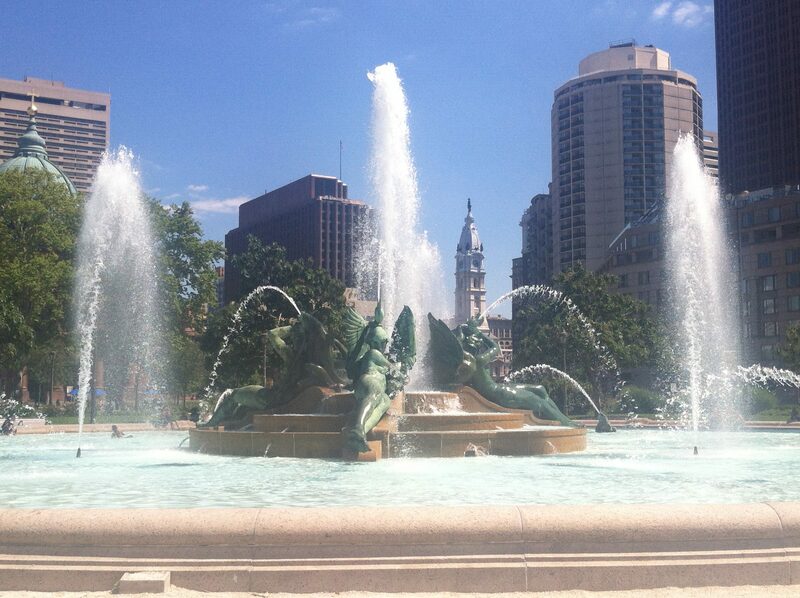 Logan Square is the northwest square in Center City, being one of William Penn’s original five squares. Originally a burial ground, this park is now at the center of the Benjamin Franklin Parkway. It is bordered by several other attractions, including the Franklin Institute to the west, the Free Library of Philadelphia and the Mormon Temple to the north, the Cathedral Basilica of Ss. Peter and Paul to the east, and the Academy of Natural Sciences and the Moore College of Art and Design to the south. Despite being called “Logan Square”, it is actually a circle, or at least the main section of the park is. At the center is the Swann Memorial Fountain, which is flowing with water during the warm months. The views of City Hall and the Philadelphia Museum of Art are spectacular. It is also home to Sister Cities Park, a small park on the east side of Logan Square containing a cafe, outdoor seating, and a small water playground for small children. It has a concrete compass with all of Philadelphia’s sister cities marked to their appropriate directions. During the summer, Rita’s water ice is sold outside the Basilica. Around the park, various memorials and small monuments can be found. A memorial to the Air Force in World War I is across from the Franklin Institute, and the All Wars Memorial to Colored Soldiers and Sailors, honoring African Americans in the military, is nearby. Slightly northwest of Logan Square is a memorial to the Civil War, with the names of battles listed on two stone pillars. As a general notice, this park generally has more homeless people than the other 4 squares. One of the unfortunate but inevitable aspects of city life.